The backbone of FLIPPING: An Uplifting Novel of Love is drawn and converged into a fiction story from my personal experiences and the people I've met directly or indirectly. The location is at where I am familiar with, Southern California, especially Los Angeles area. I dedicate this book to all the people who face their shortcomings and strive to reach their aspirations with courage. After years as an optometrist, I’ve realized that every person is a unique individual, and every soul is precious. I know this sounds clichéd. However, that's my conviction. I write in an easy-to-read style and the main characters are everyday people to whom the readers can relate one way another. There are scenes that readers can even resonate. My novels are in the Romance genre because Romance is an intriguing genre for me. I write about it because I have found that relationships are quite involved in real life. I like to use romance to depict the intricacy of relationships. It’s my vision to use "romance" as a vehicle to draw out a true-love story. Eventually, it evolves into an inspirational and thought-provoking tale. 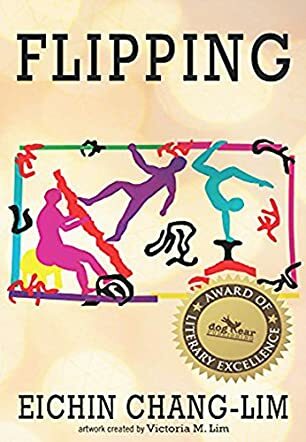 Flipping: An Uplifting Novel of Love by Eichin Chang-Lim is a novel that walks the reader through different kinds of love. There is love between two people, but there is also love for one’s self. Divided into three parts, the novel covers two stories about two generations who fall in love, face the hardships of love and discover the true meaning of love. The story begins with JonSun and SuAnn, who might be different from each other, but their love for one another is no different. When the world is coming at them from all sides, the lovers get married in secret and make their love immortal, but sometimes love is not enough. Years go by and now their son, Wynson, meets a charismatic girl named Christa. This beautiful gymnast is deaf and can only hear with her cochlear implant, but that does not stop her from pursuing her dream. Her thirst for achieving her dream makes her even more attractive to Wynson and soon the two of them fall in love. But nothing is easy for them. Christa receives devastating news that almost crushes her soul and Wynson has his troubles that might take Christa away from him forever. Can these two overcome their troubles? Can love help them find the way? To say that this novel is just a romance would not be enough because it delves far too deep to take it lightly. From themes such as finding the energy to love oneself first before loving someone else, fighting for your dreams, achieving your dreams, and fighting for what you believe is right are just some of the themes that I encountered while reading this novel. The pace of the novel was fast without rushing anything, the characters were given space and time to grow, develop ideas and become real people that cannot be ignored. Every character brought something new to the story, taking the plot forward and ensuring that the reader remains interested in the story. I found layers upon layers of great reading material that made me read on and wish for more material. This is a truly exceptional novel! Discover the joy of love through sacrifice as two couples risk all for happiness in the stunning novel Flipping by Eichin Chang-Lim. JonSun and SuAnn met in college and fell in love at first sight. Drawn together by their love for old American films, the two must face adversity and make the ultimate choice for love. Abandoning all, the young couple moves to the United States to start a new life. In their first years as Americans, JonSun and SuAnn triumphantly welcome a baby boy into their family and find success flipping houses. Brilliantly happy, only one thing mars the couple's joy; JonSun's desperate need to prove his worth. Born deaf, Christa McMeri has struggled to fit in her whole life. Only her adopted sister, Jadelynn, and childhood best friend, Wynson, seem to penetrate her lonely world until she is introduced to gymnastics at a young age. Discovering her passion as a gymnast, Christa quickly determines to become an Olympic medalist. In her senior year in high school, Christa is thrown when her life takes a dark turn. Faced with a life-changing event, Christa is left feeling unworthy of love. Can she accept love with her disabilities? Will she be able to conquer her fears and learn to live? Flipping by Eichin Chang-Lim is a beautifully tender novel of two couples struggling to navigate life's uncharted seas. Beginning with the parents' stories, the reader is drawn into the lives of Taiwanese immigrants and Americans, interweaving the two families together in a touching account of love, life, and conquering fear. I laughed, I cried; I laughed some more, then cried some more. The characters are so excellently portrayed; I easily empathized with each of them. Every character was a shining star. Rarely have I found a book so powerfully written, and a story so poignantly told. As a mother of a special needs child, I understood Christa's mother's battles, her tears, and fears. I appreciated how the author wove so much valuable information into the story. This book is a perfect read for families or friends of the hearing impaired. The way in which the author wrote both parts of the story was heartwarming and empowering. I would recommend this novel to those who enjoy romantic stories with substance.